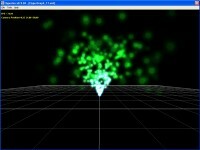 Shows how to initialize a particle system through a point emitter, including gravity, color and size actions. 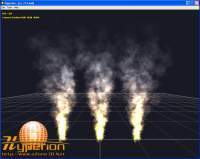 The code shows how to set the emission direction (spawn direction) to get a particular effect. The code shows how to set the emission type, the particle life time and its initial speed. It shows how to accurately act on these parameters as well as on the particles color variation and size variation velocites. This code performs pretty the same thing as the code sample 17, but uses more accurately the blending technique (blending is automatically used in every code samples featuring particle systems but is often invisible in the code, which doesn't require the user settings). It shows how to use basic position dependance princples by setting a master (master_object) to the point emitter, the master being the light in this case. 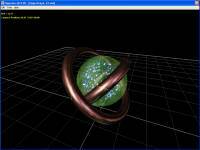 LUA scripting is used to move the light. 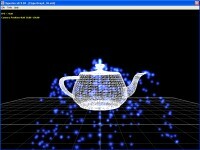 Shows how to initialize a particle system with color, size actions and line emitter. Perform the same thing as in code samples 17 and 18, but introduces a line emitter. This codes shows how to use LUA scripting to rotate objects and how to initialize a particle system wiht a sphere emitter. 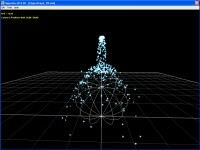 Shows how to use particle system with an obstacle. In this case, it is a spherical obstacle. 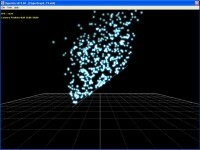 The sphere obstace is a primitive that is rendered to clearily see the impact of te particles. Shows how to use particle system with a plane obstacle. Here, there are two plane obstacles. The code shows how to setup a fast rendering mode depending whether or not the graphics controller supports it (point_sprite parameter). 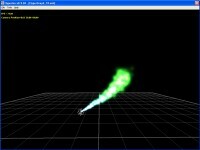 Shows how to use the orbit point action in a particle system to attract particles towards a specific object. 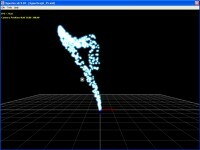 It shows how to control the orbit acceleration vector to get a special effect. 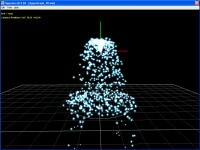 Shows how to use the mesh emitter in the particle system. 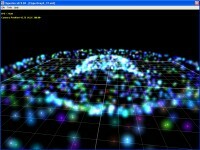 Shows how to use the disc emitter in the particle system. 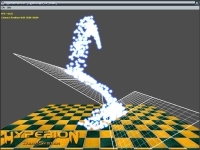 Shows how to use the disc obstacle in the particle system. Shows how to create a realistic smoke effect. Page generated in 0.002838134765625 seconds.